the great thing about betti’s coco balls is that there is no baking or cooking required – get your mise-en-place done and you are good to roll. this is a great dessert to whip up when you do not have much time and it can be made a day in advance. 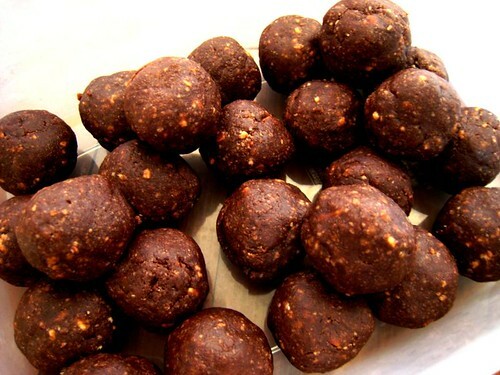 at the end of the day, you got yourself a luscious, rich chocolate ball with a little surprise in the middle. i need to shout out to the gorgeous betti for sharing this wonderful hungarian dessert with me and now has given me the permission to share it with all of you! 1) 500g biscuit powder – i used arnotts milk arrowroot. pop the biscuits in a bag and smash them to death. it does not necessary need to be fine powder. 200g powdered sugar – once again i cut down quite a lot – i used most probably 120g of sugar. taste the mixture as you add in the sugar – you might not need all 200g. 5) sour cherries – i used fresh cherries instead. 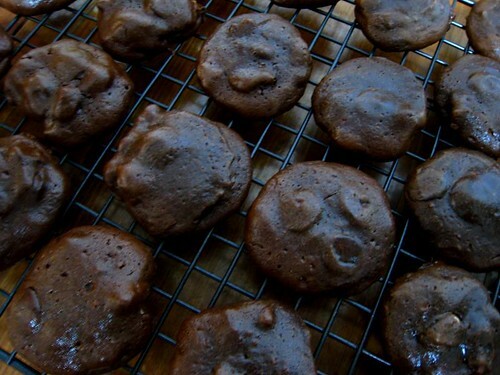 - mix the biscuit powder, butter, cocoa and powdered sugar with sour cherry liqueur, with wet hands. 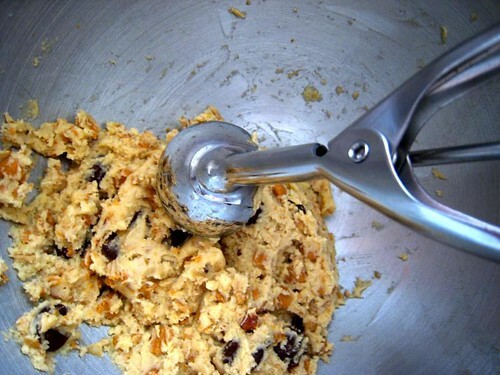 for the liquid, you need to add enough to bind the mixture into a dough – you most probably need 1/2 – 1 cup of liquid (if you do not want to add in any alcohol, water is fine) – just add in bit by bit till the dough firms up. 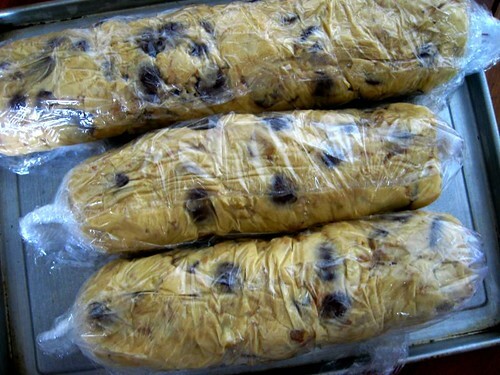 - scoop a tablespoon of the mixture, flatten and put half a sour cherry into the dough, and gently roll it into a ball. if the dough does not bind or start to crack, dip your fingers in the plate of water and gently pat and seal the dough. 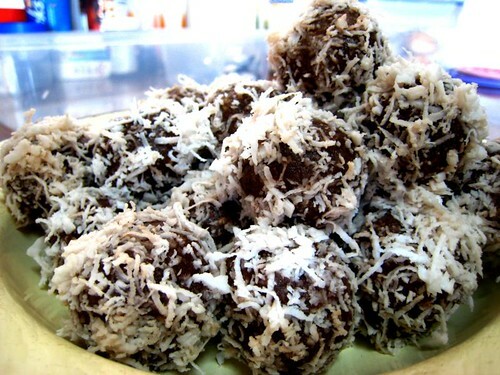 - roll the ball in the grated coconut flakes. 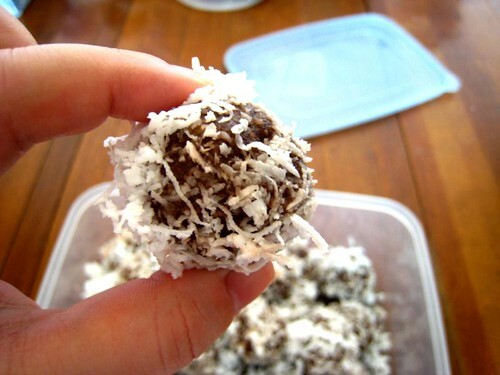 - once done, put the coco balls in the fridge for a few hours (at least 2 hours) before serving . i seriously found a piece of heaven in these brownies – they are rich, moist and delightful. every bite of this brownie is a bliss. and they are also the easiest brownies to make. 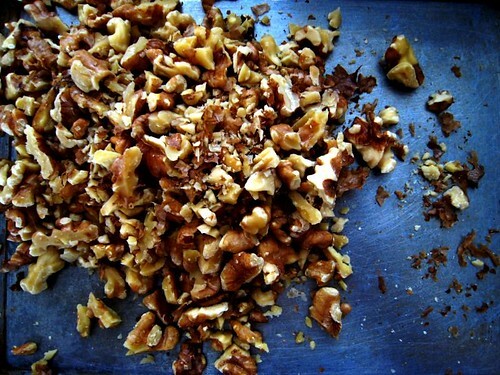 if you do not have any hazelnuts on hand, no fear – you can use pecan, walnuts. every time i made these gems, everyone squeaks in delight. *the recipe calls for 225g of sugar which i dramatically reduced to 140g. thanks to cory, i realised the recipe posted has a mistake – you will need 25g of sifted cocoa powder (not cocoa butter). while reading dorie greenspan blog, i cannot believe i miss out on this simple cake – french yoghurt cake - from her baking cookbook. and the next thing i was pretty amazed was there is no butter in the cake! i love butter, but i never like creaming butter and sugar together. its tedious and used up lotsa my energy. this was of course prior to owning a kitchenaid and a handheld mixer. still i am a throw-everything-together-and-mix kinda girl. this recipe is heaven. hmmm a pig snout or a pig trotter? 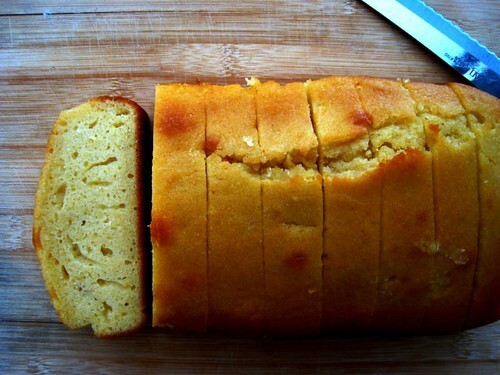 the texture of the cake is similar to a pound cake but lighter. though there is no butter, it does not lack in flavor – it is rich and moist. what i really love about this recipe is the use of ground almond. 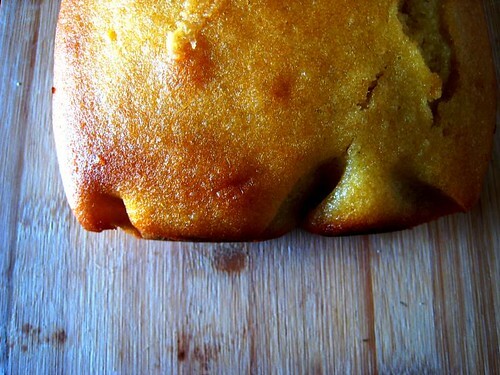 you get a bit of crunchiness, a bit of nutty flavor in the cake which go so well with the added lemon zest. this is one cake i will make anytime. gina depalma’s dolce italiano is one of the many cookbooks i have yet to study properly. 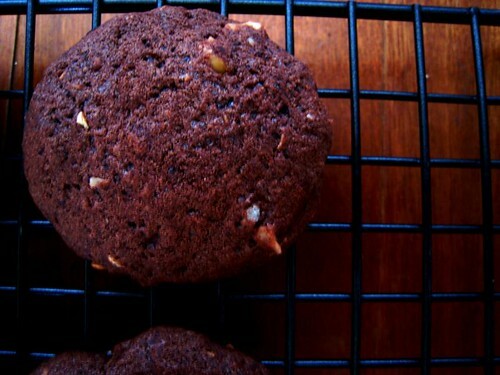 however i always have this habit of skimming through the book – and one recipe that caught my eye – bittersweet chocolate and hazelnut cookies. if you love nutella, you will love these cookies – they are delicious and rich without being overly sweet. these are not cookies that you can munch as snacks (too rich) but they made great after meal dessert (warm cookies, a scoop of vanilla ice cream – you get the picture). 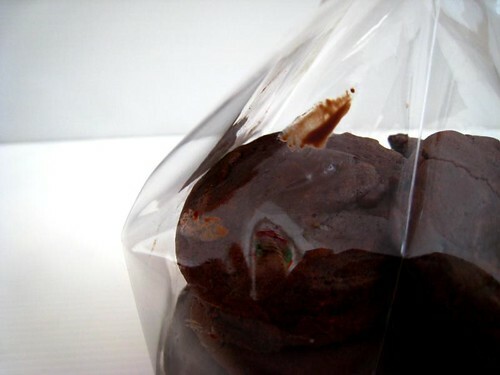 the key to making these cookies is using quality chocolate and cocoa powder – i used valrhona 70% bittersweet chocolate and their cocoa powder. its divine! and of course, these babies were wiped out on the day i baked them. flour was one of the many cookbooks that i recently bought. 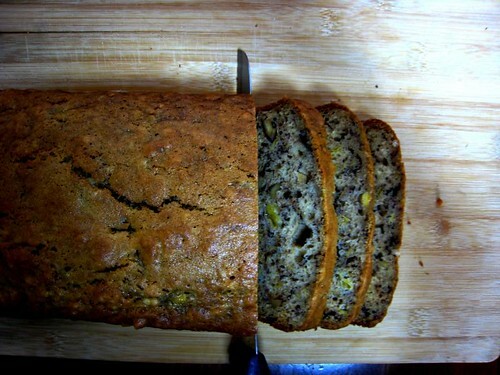 i have yet to thoroughly examine it but there are a couple of items that got my attention – one of them is flour’s famous banana bread. at first i am skeptical about the recipe – it has NO butter. the last time i made something without butter, well it was aint that great. 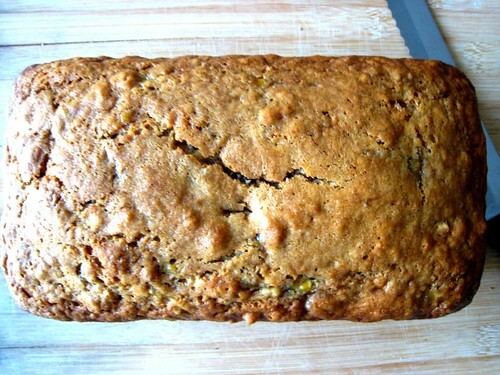 still i am pleasantly surprised by how delicious the banana bread was (without butter) – the flavor of banana and cinnamon come through. can you spot the banana bits? there is one thing i changed in this recipe – sugar. the original recipe called for 230g of sugar – i only used 130g of sugar which was good enough. this is dependent of the “quality” of the bananas. mine were pretty sweet (i used raja bananas – they are small, stubby and sweet – often used in goreng pisang). in july i might make a trip to boston and i do hope i get a chance to drop by at flour. 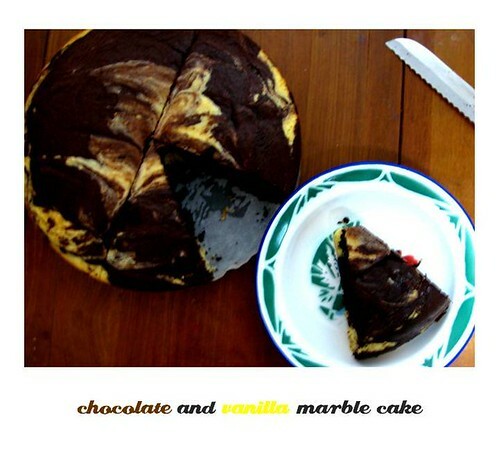 the first bite into rachel allen’s chocolate and vanilla marble cake – it was rich and buttery, and the cake reminded me of a lighter version of a pound cake. mdm tan kept the leftover cake in the fridge. the drop in temperature “compact” the cake and somehow the flavor was similar to my favorite childhood cake – sara lee pound cake! when i was a kid, if we go to a supermarket*, i will always grab a loaf of sara lee pound cake. 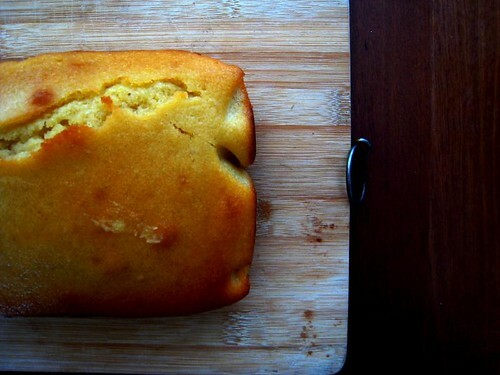 i dont know why but i really love the pound cake (and my favorite was chocolate). i will have it for breakfast, for dessert. it just made me very happy. rachel allen original recipe is a mixture of chocolate and vanilla flavor, i made some modification and completely chocolatified the cake (i used four large eggs (or five medium eggs), 80g of cocoa powder and 165g of sugar**). 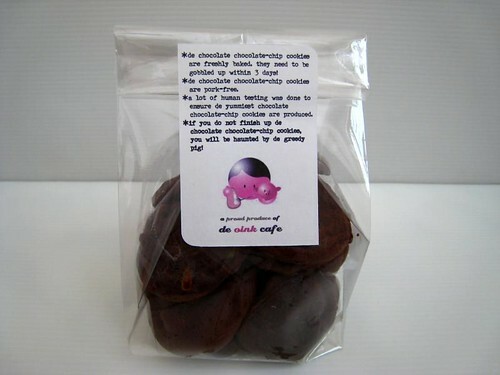 and yes the chocolatify version made me very happy too. *even till now, we do not shop in supermarket very often. mdm tan preferred to get her vegetables and meat from the wet market. so going to the supermarket when i was a kid was a rare treat. **the original recipe called for 225g of caster sugar which is just scary in my terms. for the chocolate and vanilla version, i only used 160g of caster sugar. as i used valrhona cocoa powder which is dark, rich and bitter thus i added a bit more sugar when i made the full chocolate version. as i was flipping through one of my favorite cookbooks – king arthur flour’s cookie companion – the recipe for “golden crunch cookies” just popped up. 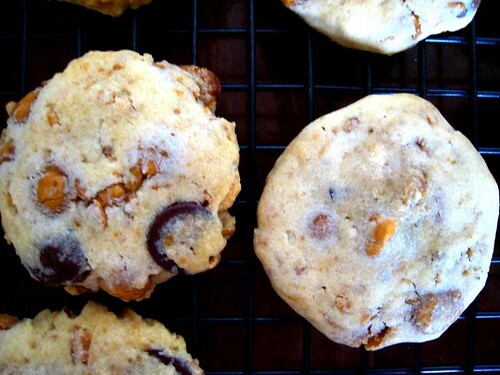 the cookies have two of my favorite things – butterscotch chips and cornflakes. i did not have any cornflakes in my pantry and i am too cheap to get some from the store, i substituted it with my post’s great grains crunchy pecans. these cookies were seriously easy to make. and because i had a kitchenaid (yeah! ), it made things even simpler. all i needed to do was cream the butter and sugar, dumped in the butterscotch chips, chocolate chips, cereal mix and flour and viola. now this is the “i have no idea what the hell happened” bit. it was clearly stated in the recipe that i was supposed to roll the dough into a small ball and pressed it down. out of nowhere, i decided “hey i think i shall use the ice cream scoop instead”. of course midway through baking, i realised my mistake and tried to make things right. so was there any difference between rolling and not rolling the dough into a ball? the answer is yes. 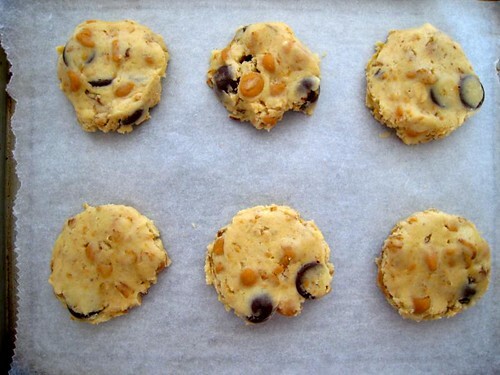 if you choose not to roll the dough, and do a drop and press, the result is more rustic looking cookies that have a bite. 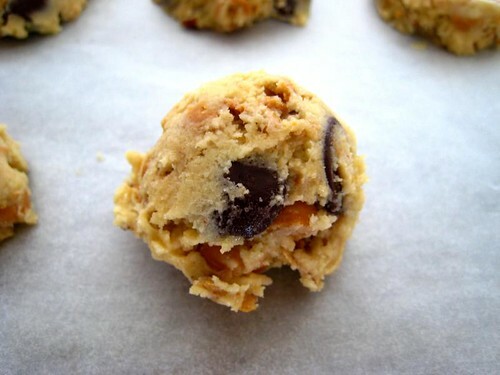 and if you decided to roll the dough into a ball, the cookies are more like a lighter version of a shortbread – though crumbly, it still melt in your mouth. 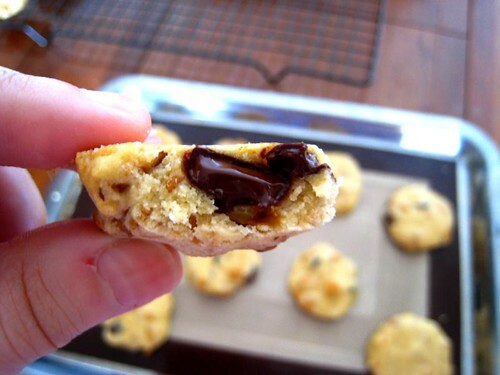 reason why we should bake cookies – molten chocolate! there is no right or wrong. its a matter of preference. as much as i love rustic looking treat, i prefer the “shortbread” version – because a) looks nicer especially when they were intended to be given as gifts and b) always love a cookie that melts in my mouth. i needed to bake something to be given away. it is for a woman named hazimah who draws my blood. i am one of those people whom doctor can never ever find the vein for blood test. i ever had this doctor who poked me THREE times before he finally found the right vein. hazimah had skillfully doing it for me, with no pain no drama. she did it with humor and singing – everytime we meet, she will sing the “mandy” song (in case, you wonder, yes i am indeed named after the song). since i am going to visit her, i decided to pass her a bag of cookies - as a thank you, for not poking all over my arm. i settled on david lebovitz chocolate chocolate-chip cookies. i have been eyeing at this recipe for awhile – it never failed to shock me how much chocolate is involved. the amount of chocolate is obscene. 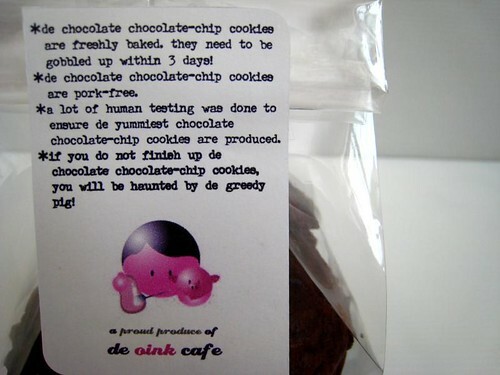 i was rather worried – will hazimah and i slip into chocolate coma after eating this cookie? the cookies are rich and delicious. especially when they are fresh out from the oven, they are gooey and oozy. 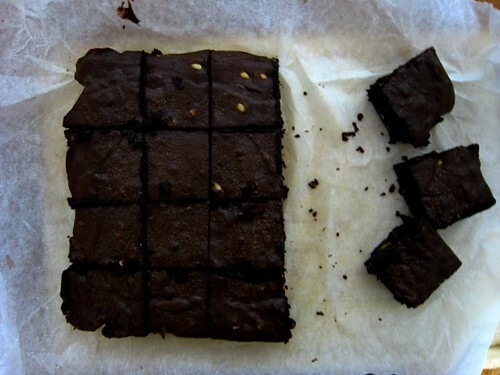 i purposely underbaked some of them – those turned out to be fudgy – they are like a more delicate version of brownies. i am unsure if hazimah loves the cookies. however i love the surprise look on her face. she gave me a surprise too. before i left, she gave me a hug. i am happy. it has never crossed my mind to ever bake a cheesecake. because of a silly lame reason – where am i going to get graham cracker? in singapore we do not have graham cracker. thus this translate to me – no graham crackers = no base for cheesecake = no cheesecake. however after i did a search, i realised that graham cracker = digestive biscuits! duh!! and of course most importantly i found one of the easiest recipes for cheesecake. rachel allen‘s baked cheesecakes with blueberries. the numbers of ingredients for this recipe are a few and the method is so simple. its great for first timers like me. though i have some blueberries at home, they were not that great for bakes thus i decided to omit them. 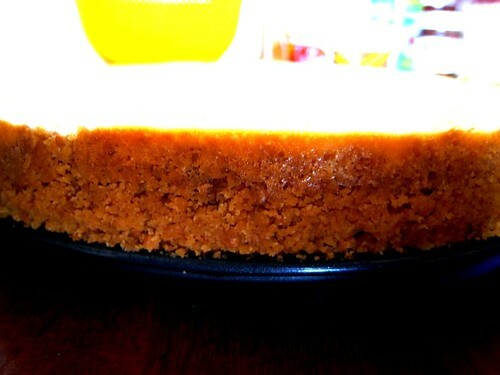 instead i used zest of one lemon for the cheesecake to cut through the richness of the cake. the cheesecake was wonderful. 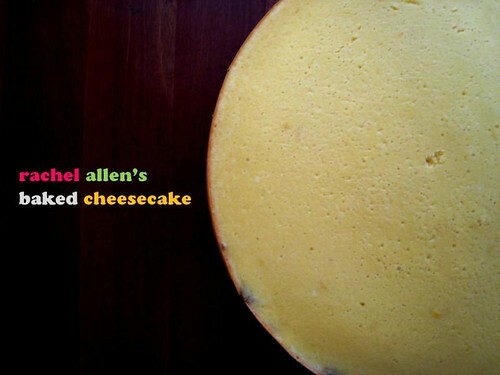 unlike new york cheesecake which is rich and dense, rachel allen version was more custard-ish. the cheesecake was more pudding-like thus everything just melts in your mouth. the amount of prep and baking time, this recipe is definitely a keeper. as a home-baker, i believe that one of the easiest things to bake is cookies. 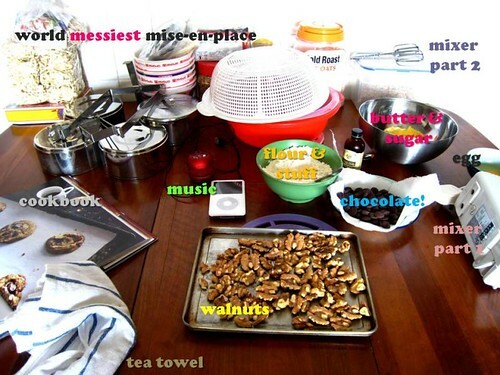 its about getting everything in place (aka mise-en-place) and putting the ingredients together. there is always that few cookies you will start off – oatmeal raisins, sugar cookies and of course chocolate chip cookie (ccc). i have baked many “versions” of ccc – so far, the one that i like best is from david lebovitz. david lebovitz’s ccc are pretty straightforward – the standard ingredients, cream butter and sugar and mix all in together. 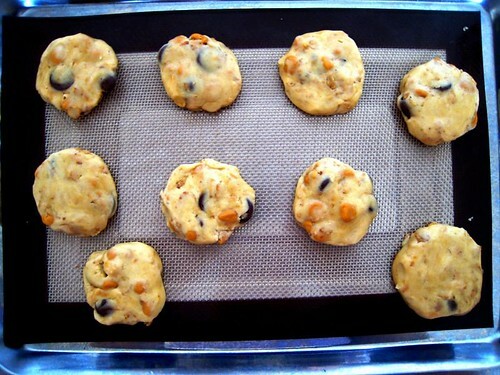 the only tedious things you need to do – roast the nuts and refrigerate the dough for a couple of hours. 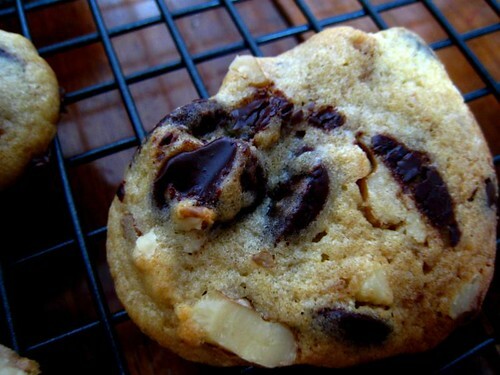 perhaps its the process of letting the dough rest that makes this cookie so good. and what is great about refrigerating the dough – you can also freeze it and bake it as and when you desire (or when your craving strikes!). for the recipe, please visit serious eats recipe!